This title features over 180 sensational classic and modern dishes from east and west, shown step-by-step in more than 700 stunning photographs. 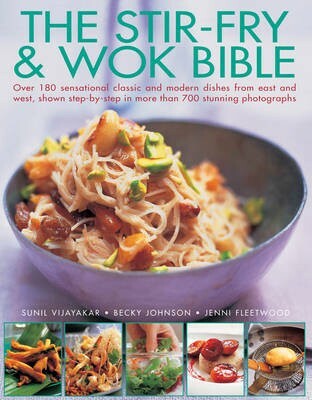 You can explore the amazing versatility of the wok in this special collection of fabulous dishes. It contains a dish for every occasion, from crisp spring rolls and succulent steamed dim sum to fresh stir-fries, spicy curries and sticky desserts. It includes over 180 recipes from China and South-east Asia, including such wok classics as Crispy Thai Noodle Salad, Chinese Braised Pork, Seafood Tempura, Stir-fried Beef in Oyster Sauce, and Nasi Goreng. It provides expert advice on preparing ingredients and wok techniques, and covers cooking methods from steaming and stir-frying to braising and deep-frying. It contains 750 photographs, step-by-step instructions, cook's tips, and a nutritional breakdown for every recipe. The simple wok is one of the world's oldest and most popular cooking implements. Inspired by its versatility, and the delicious tastes of South-east Asia, this irresistible new book brings together a mouthwatering collection of dishes. An expert introduction provides information on types of wok, its history and other special equipment, as well as practical advice on preparing ingredients and using a wok. There are 180 recipes from a range of culinary traditions from the sweet coconut curries of Southern India to the fiery Thai stir-fries. Every dish is photographed step by step, making it easy to achieve success every time.